Description: Based in Los Angeles, Kareem Carts has been operating for 30+ years on the business of offering almost every kind of mobile food-based vending vehicles that one can think of. Though we started in Carts, and can find and make everything from popcorn to hot dog to roasted nut carts, Kareem’s also works with our customers to generate Trucks, Mobile Kitchens, Trailers, and all other manner of street vending and production. We help customers to design their dream vending cart/truck, assist in the city regulation paperwork when buying directly from us, and produce our custom stainless steel or otherwise outfitted product. Examples of Specialized vehicles we can and have made, not including your own custom job, are: taco truck, churro cart, food catering trailer, fruit carts, fryer trailer carts, biosnopes, coffee trucks, and many more. 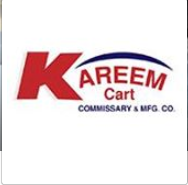 Contact us if you’re a past customer of Kareem Carts and would like to leave a review.